I have to admit I have a very soft spot for Brownies - being the easiest to bake, these are one of my cherished desserts, especially when you need something quick and satisfying to uplift your mood or indulge your sweet tooth. Plus, they are a hit with my toddler too, though I try to restrict indulging her! 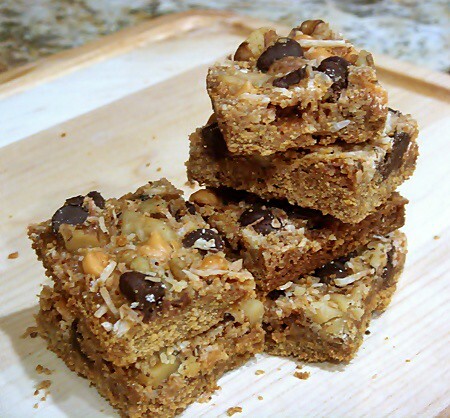 The Magic Cookie Bars, or Blondies, as I would call them, are a lovely variation from the traditional brownie recipe. It does not use any flour, just graham cracker crumbs, condensed milk and your favorite toppings. Plus, it is so versatile, you can easily swap toppings with your favorite ones, peanut butter chips, butterscotch chips, white chocolate, pecans, pistachios, almonds - throw in everything and you'll still end up with one perfect recipe! Heat oven to 350 degrees F (325 degrees for glass dish). Coat 13x9-inch baking pan with non-stick cooking spray. Combine graham cracker crumbs and butter. Mix well with your fingers so everything is evenly buttered. Then press gently into bottom of prepared pan, evening out the layer with your palms. Pour sweetened condensed milk evenly over crumb mixture. Layer evenly with chocolate chips, coconut and nuts. Press down firmly with a fork. Bake 20-25 minutes or until lightly browned. Allow to cool completely on a wire rack. Then take a serrated knife and cut into bars or diamonds. The magical Blondies can be stored in an airtight container at room temperature up to 2 days. Yum, Those magic cookie bars look very delicious, They would go great with a cup of coffee from my keurig mini brewer plus. Love the versatility and options to personalize this recipe - plus it is so kid friendly!! I too have a soft spot for anything bar shaped and sweet! I'll have to try these out- thanks for posting! That sounds like a fantastic idea. Great looking cookie, too! Glad you had such a great work.